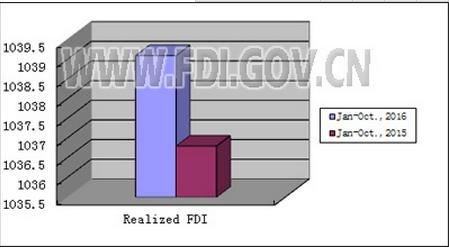 According to the statistics of news release of foreign investment, from January to October 2016, Newly Approved Foreign-invested Enterprises amounted to 22580, up by 7.4% year on year; and the actual use of foreign investment reached RMB 666.3b（USD 103.91billion）, up by 4.2% year on year. 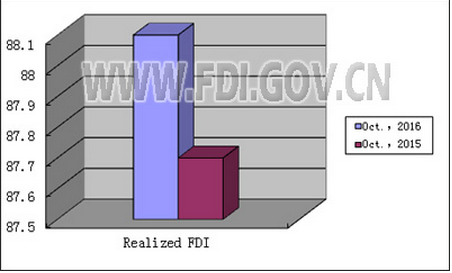 According to the statistics of news release of foreign investment, in October 2016, Newly Approved Foreign-invested Enterprises amounted to 1288, down by 36.9% year on year; and the actual use of foreign investment reached RMB 57.28b（USD 8.81billion）, up by 4.7% year on year. 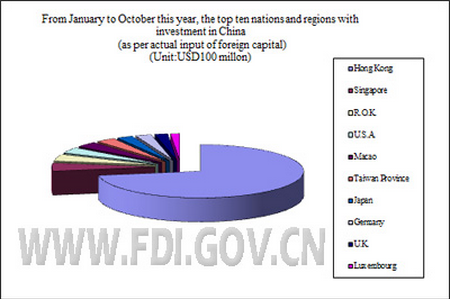 From January to October this year, the top ten nations and regions with investment in China (as per the actual input of foreign capital) are as follows: Hong Kong (USD71.16b), Singapore (USD4.89b) , R.O.K. (USD4.12b), U.S.A. (USD3.49b) , Macao (USD3.35b) , Taiwan Province(USD2.98b) , Japan (USD2.46b) , Germany (USD2.44b), U.K. (USD2b) and Luxembourg (USD1.38b), total of which accounted for 94.6% of total actual use of foreign investment in the country.